Cleaning your floors can be a nearly daily chore for people with hardwood or tile flooring as dust bunnies, crumbs and dirt are so visibly exposed. While the Roomba has been beneficial to people with carpet, it doesn't ease those suffering back pain from Swiffering multiple times a week. 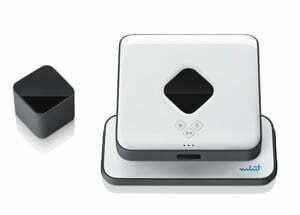 However, help may be on the way this summer in the form of a robotic floor mop called Mint which was released at the Consumer Electronics Show in Las Vegas earlier this month. I had the opportunity to see a first-look demo of the Mint from Evolution Robotics and was impressed on a couple of different fronts. Both the shape and some nice safety features make the Mint product particularly useful. 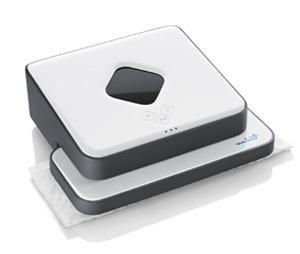 First off, the square shape (unlike the Roomba's round design), enables the Mint to get into corners, and because the Mint is only ten inches wide, it can maneuver between most chair legs and other obstacles. Built-in sensors detect area rugs and avoid them and, more importantly, if you have drop-offs or stairs in the vicinity, Mint's sensors will recognize it and make sure that it doesn't take a tumble. The Mint Cleaner can handle both wet and dry hard surface cleaning—and instead of forcing the consumer to buy a proprietary product, the Mint uses popular cleaning cloths, such as Swiffer™ brand Dry and Wet Cloths, Pledge™ Floor Wipes and other similar products. The Mint has its own navigation system called NorthStar, which enables it to track the areas that have been cleaned. A separate GPS-like device uses the NorthStar technology and acts as a beacon that incorporates information from the Mint to map the room, plan areas for cleaning and pick up spots not covered on the first pass. Priced at under $250, the Mint will be available directly from Evolution Robotics this summer, or in retail stores this fall. If you're interested in watching out the Mint in action, check out the video below. My parents have nearly all hardwood floors in their house because my dad has terrible allergies so I think this will make the perfect belated Mother’s Day gift! My mom has wanted something like the Mint Cleaner for a long time.